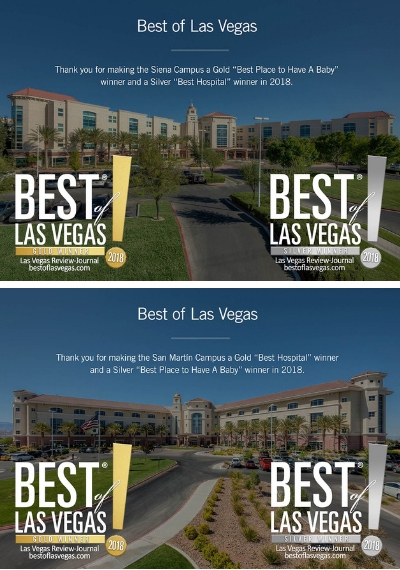 November 13, 2018, Las Vegas, Nevada – The people of the Las Vegas area voted the San Martin and Siena Campuses of Dignity Health-St. Rose Dominican Hospitals as the Best Hospital and the Best Place to Have a Baby for 2018. The recognition was among several such honors given to local businesses and organizations through the Annual Best of Las Vegas Awards, sponsored and announced by The Las Vegas Review Journal. Specifically, the San Martin Campus received a Gold ranking for Best Hospital and a Silver ranking for Best Place to Have a Baby. Conversely, the Siena Campus received a Gold ranking for Best Place to Have a Baby and a Silver ranking for Best Hospital. “Our Founding Sisters would be proud,” said Sister Kathleen McGrail, Vice President of Mission for the Siena Campus. The Adrian Dominican Sisters purchased the original hospital – the St. Rose de Lima Campus in Henderson, Nevada – for $1 in 1947 from the U.S. government with the understanding that the Congregation would run the hospital for 25 years. In the past 70 years, the Siena Campus was built in Henderson, Nevada, in 2000 and the San Martin Campus in Las Vegas in 2006.